Facebook developed a 3-D 360-degree camera system with an eye toward the 360-degree videos it recently introduced to the social network. Facebook Surround 360 will not be branded or sold by Facebook. Rather, the social network is open-sourcing the technology, with plans to post the design specifications and stitching code on GitHub this summer. 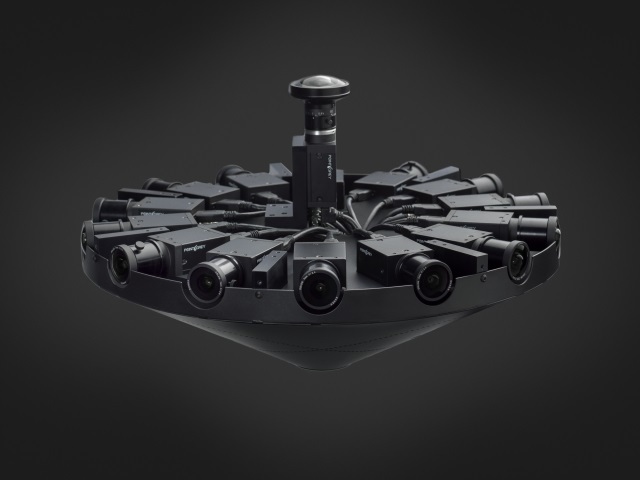 The system seamlessly combines the video from 17 cameras—14 wide-angle cameras bolted to a horizontal ring, with one fish-eye camera on top and two more on the bottom—helping slash production effort and time. We’re open-sourcing the camera to accelerate the growth of the 3-D-360 ecosystem—developers can leverage the designs and code, and content creators can use the camera in their productions. In designing the camera, we picked a set of requirements that would ensure that creators could capture scenes and tell stories that are as sharp and as realistic as they’d like. The rig is composed of 17 globally synced cameras: 14 wide-angle cameras are bolted onto a horizontal ring, with a fish-eye camera on top and two on the bottom, making it possible to capture not just 360 video but also everything up and everything down. This camera captures truly spherical video. The 14 cameras around the ring mean that the camera captures stereoscopic video, necessary for 3-D capture. Camera sensors capture with a global shutter, meaning that moving objects in the video will be free of rolling shutter artifacts. A rugged aluminum chassis ensures stable, well-aligned images, while the industrial cameras can run for hours without overheating, making it possible to reliably capture footage for prolonged periods of time. Building on top of an optical flow algorithm for the stitching code is a mathematically rigorous approach that produces superior results. Our code uses optical flow to compute left-right eye stereo disparity. We leverage this ability to generate seamless stereoscopic 360 panoramas automatically. The stitching code that comes with Facebook Surround 360 largely eliminates the hand-editing part of 3-D-360 video processing, dramatically reducing the post-production time. Stitching time is reduced from weeks to overnight. The system exports 4K, 6K and up to 8K video for each eye. The 8K videos double industry standard output and can be played on Gear VR with Facebook’s custom dynamic streaming technology. Readers: Have you watched 360-degree videos on Facebook?